We finally turned the boat over! 10 guys plus wives, girlfriends and kids turned up to help. 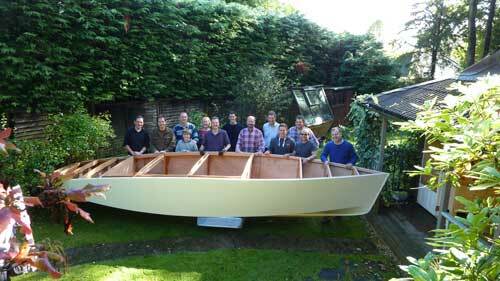 So after coffee and a slice of carrot cake (my wife's best cake) we all retired to the workshop to move the boat. Although the doorway is plenty wide enough for the boat it's a tight squeeze for a boat plus lifters, much like the monkey trying to get the stone out of the jar story. So we had to line up such that we could zig-zag through the opening. Getting it back in was much easier as it could be slid on it's keel with a big push. Janet did a great job with the camera such that I can post this animated gif of the whole procedure. So a BIG thank you to the Boat turning Team.